First haircut. First steps. First words. Our Precious Pooper skips ’em all and goes straight for the good stuff: first curse word, first middle-of-the-night call to the doctor, and first apocalyptic poop. 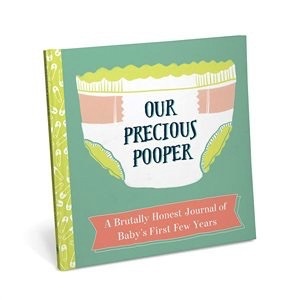 Record baby’s funny, annoying, infuriating, and completely inexplicable milestones here so you can (hopefully) laugh about it later. 96 pages. Hardcover with ribbon page marker. 20 x 20cm.